The official first look poster of Vijay's "Puli" was released on the midnight Today, 20th June. But earlier in the day, a magazine had revealed some poster of the movie, which had raised a lot of expectations on the offical poster. 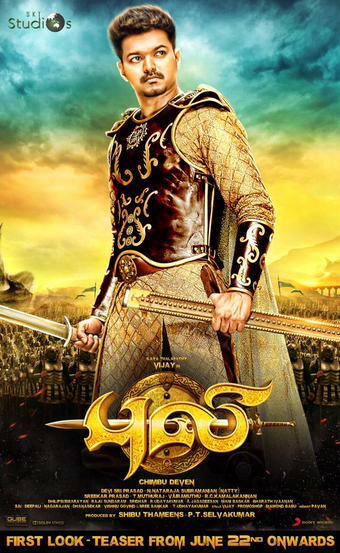 In a surprising development, the first look posters of Vijay's "Puli" were released by a magazine. Nonetheless, it became a big reason for Vijay's fans to celebrate the occasion. The birthday (22 June) celebration of the actor has begun early for them. The look has impressed the audience and they are praising it to the heavens. The photos of Vijay clearly indicate that the actor will be seen as a warrior. In some pictures released by the magazine, he is seen wielding a sword and his avatars might remind you of his looks in "Asaka Laska" song from Shankar's "Nanban". Meanwhile, the makers will release the official teaser on the night of Sunday, 21 June. This will pave way for the birthday celebration of Vijay, who turns 42 on Monday. However, this time, the actor will not be in Chennai on the special day as he is holidaying with his family in London. The fans of Vijay have started the trends related to "Puli" on Twitter. The celebration is expected to rule the social media for the next few days. 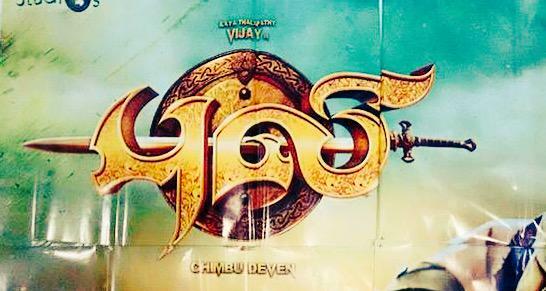 "Puli", which is made with the budget of ₹100 crore, is directed by Chimbudevan. The movie is produced by PT Selvakumar and Shibu Thameens. It has Kannada superstar Kiccha Sudeep, Shruti Haasan, Hansika Motwani and Sridevi Kapoor in key roles. It is likely to hit the screens on 17 September, on Ganesh Chathurthi.